Located approximately 45 kilometers northwest of the city of Madrid, Spain, the Royal Site of San Lorenzo de El Escorial, commonly referred to as El Escorial, preserves the historical residence of the country’s royalty and is open to the public as a living history museum facility offering tours and public programming. El Escorial was originally established as part of a codicil in the will of Emperor Charles V, who ordered the establishment of a religious foundation for the purposes of the interment of himself and his wife, Isabella of Portugal. The emperor’s son, Philip II, appointed architect Juan Bautista de Toledo to oversee the project’s completion in 1559. The following year, a site was chosen within a farming valley in the Guadarrama Mountains for the project, near the town of El Escorial, and in 1567, the new facility was entrusted as a monastery to the Hieronymite Order. The facility was named in honor of Saint Lawrence of Rome, who was believed to have had Hispanic origins, and was intended to serve as a dual royal residence and monastery facility. Construction on the facility began in April of 1563 and was completed in September of 1584. 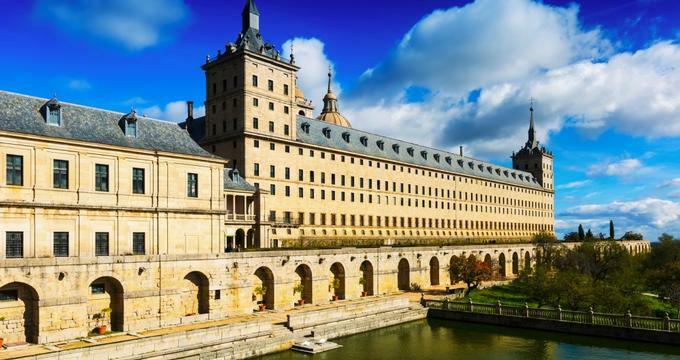 The residence is credited as the impetus for the development of the present-day town of San Lorenzo del Escorial, which began to develop following the residence’s opening in 1584. The facility suffered fire damage several times throughout the 17th, 18th, and 19th centuries, including a 1671 fire that led to the construction of new roofs by Gaspar de la Peña and Bartolomé Zumbigo y Salcedo. In 1885, the Hieronymite Order was replaced by the Order of Saint Augustine, who remain the facility’s resident religious order to this day. A number of paintings housed at the residence were transferred to Madrid’s Museo del Prado in 1939, and in 1963, the palace’s Nuevos Museos gallery was created to showcase the remainder of the facility’s art collection. An architectural museum was also created at this time to showcase the building’s construction and architectural history. In 1984, the palace was declared a UNESCO World Heritage Site. Today, El Escorial is one of the most-visited landmarks in the country of Spain, attracting more than 500,000 annual visitors. The site is operated under the administration of the Patrimonio Nacional and is operated as a UNESCO World Heritage Site. The property serves as a royal residence, monastery facility, and boarding school residence and is open to the public as a living history museum, offering tours and public programming throughout the year. The palace is located at the foot of Mount Abantos, within the Sierra de Guadarrama mountain range, and is easily accessible as a day trip from nearby Madrid. The site showcases two architectural complexes, the royal monastery building and the La Granjilla de La Fresneda monastic retreat and royal hunting lodge. The monastery building is known for its unique gridiron floor plan, which is believed to have been chosen to honor Saint Lawrence, who died in the 3rd century A.D. as the result of being roasted to death on a grill. Visitors enter the monastery complex through the Courtyard of the Kings, accessible from the palace’s main facade. The courtyard is named for its statues of the Kings of Judah, which adorn the facade of the complex’s Basílica. The basilica’s floor is shaped in the form of a Greek cross and features a large cupola modeled after the one within Saint Peter’s Basilica in Rome. A large chapel is located within the basilica, featuring a 30-meter-high altarpiece with bronze sculptures by Leoni, Tibaldi, and Zuccari. The complex’s Capitulary and Sacristy Rooms feature paintings by notable artists such as Titian, Velázquez, and Claudio Coello. A Royal Pantheon serves as the burial site for all royal monarchs since Charles I, and a Pantheon of the Princes preserves the bodies of royal queens, princes, and princesses. Other noted royal areas within the palace include the Palace of the Austrians, the Palace of Philip II, the Pantheon of the Kings, and the Pantheon of the Princes. A Hall of Battles showcases Fresco paintings of Spanish military victories, and an Art Gallery showcases works by noted European artists from the 15th, 16th, and 17th centuries. An Architectural Museum features 11 rooms with exhibits on the palace’s construction and design, and a Library holds more than 40,000 volumes within a 54-by-9-meter great hall. The palace is also home to one of the largest Catholic reliquaries in the world, containing more than 7,500 notable relics. The palace is open to the public Tuesdays through Sundays throughout the year, with seasonal operating schedules varying and scheduled closures on major international holidays. Admission rates are offered for adults, children, students, and seniors, with guided tours available as visit add-ons, available only at the palace’s ticket office on the day of visit. Group guidance devices, including microphones and headphones, are available for rental. Guided field trip tours are available for visiting school groups, with rental fees for guidance devices waived. A tour app is available with audiovisual content in 16 languages and maps for several self-guided tour routes throughout the complex.